In April of 1936, the magazine Kamigata hanashi (Kamigata Story) was launched in Osaka. This was a rakugo (comic storytelling) magazine published monthly out of a local storyteller’s home. One mission of the magazine as laid out by the editor in the inaugural issue was to help breathe new life into a traditional art that was losing a popularity battle with manzai (two-person stand-up comedy) and other modern performing arts and media. In the second year (of four and a half) of the magazine’s run, the editor issued a call for yoshikono verses, which are conventionally written in lines of 7-7-7-5. Yoshikono submissions increased with each new issue until they filled multiple pages, reaching into the hundreds. Prizes were offered for the best entries, and public yoshikono gatherings were advertised—singers and shamisen players were even enlisted in what appears to be an attempt to revive a community performance tradition associated with Osaka storytelling in the previous century. 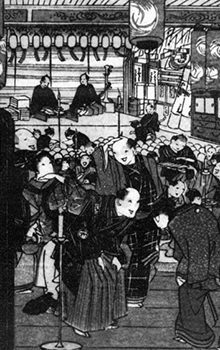 This talk will shine light on the largely forgotten art of yoshikono, discuss its role in an Osaka rakugo magazine during the WWII years, and consider the possibilities of recovering a musical tradition now widely thought to be lost. Dr Shores teaches Japanese literature and culture (e.g., performing arts, film) courses. He researches comic modes of expression, both performed and literary, from early modern times to today. He has special interest in literature and traditional performing arts of the Kamigata (modern Kansai) region, but he is also drawn to an array of other subjects. Dr Shores has informally apprenticed with rakugo masters Katsura Bunshi V (1930-2005) and Hayashiya Somemaru IV (b. 1949) and has had training in a number of other Japanese performing arts including butō, buyō, hayashi music, kabuki, kouta, kyōgen, nō, and shamisen.